General dimensions conform to MSS-SP-51. Dimensions of Bolt Hole and Circle Diameters correspond to ANSI B16.5. 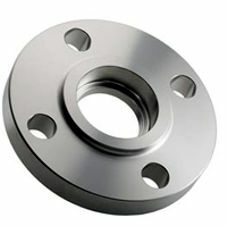 MSS Flanges are suitable for use at pressure/temperature ratings for MSS-SP-51 Class 150LB Flanges and Flanged Fittings,. All MSS Flanges are identified with the manufacturer's trademark, Nominal Pipe Size, Material Grade, and Heat Number.